As a parent, caring for your child’s health is always on your mind. We do what we can to ensure they eat healthy foods, exercise, and learn new things. There are also a number of things you can do to ensure they maintain good oral health as well. 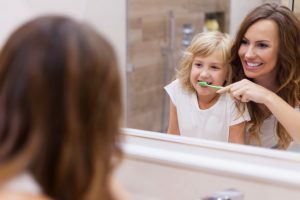 Your children’s dentist in Islip has the top tips for helping your child achieve optimum oral health. Your child should be flossing at least once per day if not twice. Parents should help children floss throughout their first years, as they won’t have the dexterity to manage dental floss on their own. Dental flossers are also great for helping little hands reach back teeth. Most parents understand that eating fruits and veggies is good for their child’s body, but did you know that it’s also beneficial for their oral health? Fruits and vegetables actually neutralize the acids in your mouth that cause tooth decay and damage to your teeth. They also help to increase saliva flow, which helps to wash away food debris in the mouth. Your friendly team at East Islip Dental Care recommends that we start seeing your child around the age of three, unless you have specific concerns early on. Our team of highly skilled dentists loves seeing children and we make every effort to keep their appointments fun and upbeat. Children should see their dentist twice per year or every six months to monitor their oral health and stay on top of any developmental concerns that may arise. At East Islip Dental Care you’ll find that we offer advanced care for children, which includes fluoride treatments to help build and strengthen your child’s teeth, and dental sealants that are designed to protect small teeth from tooth decay and cavities. If your child participates in sports, be sure to talk with your dentist about athletic mouth guards to help protect your child’s teeth and mouth from injury. If you’re looking for a children’s dentist in Long Island, look no further than East Islip Dental Care. Contact our office to schedule your child’s next appointment; we look forward to serving the entire family!